PDFMate PDF Converter Professional is a comprehensive PDF conversion application to help convert PDF to other formats for daily usage. It is a combination of PDF to Word, Text, EPUB, Image, HTML and SWF Converter. I love this PDF Converter so much. 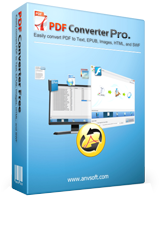 Easy to use and already accurately convert PDF to HTML file, Text and Image for me. Ready to explore the other features. - PDF to Word. Convert all kinds of PDF files to Microsoft Office 2007 Word document for further reading and editing easily and freely. - PDF to EPUB. To view PDF documents with portable Ebook reader in a more comfortable way, converting PDF to EPUB ebook format is the wise choice. - PDF to Image + HTML + SWF. A PDF can be turned to many perfect output files. So that you can view PDF document in picture format or browsing it like a webpage or even watching the file like a flash video. - PDF to PDF. Make you own style PDF file by changing its layout (A3, A4, A5) and page size (1IN1, 2IN1, 4IN1). Keep all your PDF documents in security by adding password to open, edit, copy and print action. The bulit-in OCR technology (What is OCR?) enables you to easily convert and edit scanned PDF documents with PDFMate PDF Converter Professional. You can extract texts and images from image-based PDF and convert it to editable and selectable Microsoft Ofiice Word files. - Detect scanned PDFs automatically. Detect scanned PDF files automatically when adding PDF files. A prompt dilalogue box pops up providing the options to enable OCR technology. - Two Recognition Modes Available. If you want to save more time, you can choose efficiency-priority recognition mode; if you want to get a more accurate output file, you can switch to quality-priority recognition mode. - Specify any page to convert. Not all pages of PDF file need to be converted. It happens that you only need to convert a certain part of your PDF document to the format you want. What you need to do is to input the number(s) of the exact page or page range of the PDF file and apply enter to confirm, and you can select odd pages or even pages only to convert. - Split PDF documents. The comprehensive PDF converter can also be used as a PDF splitter. It offers a great convenience for people who have to split a large PDF document. Choose PDF as the output format, input the page number or page range you need to preserve in the output file and then generate a new PDF file, or you can split one PDF file into several new files in line with selected page range. The PDF is split in simple three steps! 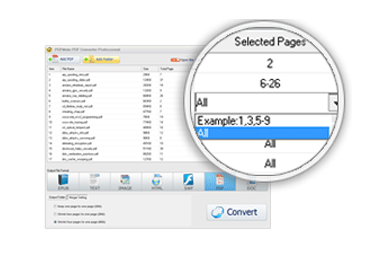 - Convert all content from original PDF files. 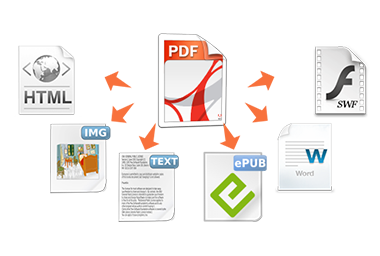 With this professional PDF Converter, you can convert all content from PDF to EPUB eBooks just the same with the original, convert PDF to sheets of images with all original content included when converting PDF to JPG image, and so on. - Extract specific content from PDF files. It is possible to extract only images of the original files when converting PDF to JPG, make new content without images, hyperlinks when converting PDF to EPUB e Books, and choose to ignore images, hyperlinks, etc. to get your own HTML. Set passwords and permissions to your PDF files to restrict who can view, edit, copy your PDFs. No adware or spyware. 2-in-1 and 4-in-1 page arrangements can rearrange files in desired order and change page size which will save papers when printing. 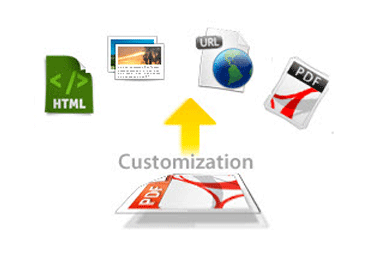 With this user-friendly tool, you can find any option you want to use easily to personalize any PDF file as you desire. It also allows batch conversion. Create flash slideshows with photos, FLV videos and songs; Burn the flash photo album to CD/DVD; Upload to Go2Album, MySpace.